Here’s an earth-shattering revelation. Brought up on an (un)healthy diet of Goldilocks, Snow White and Little Red Riding Hood, I have a marked preference for impossibly pretty, chocolate box cottages over grandiose country houses. Here, I have said it, and the world still stands (although I will probably be sent away from Country Life in shame). The great news is that, after years of pointless search, I have now found one such perfect cottage, and?hear, hear! ?I can afford it. It is in Regency Gothic style, which shows in the arch motifs that decorate door and windows opening onto the tiny front porch. The roof is pale “buy-me-now” Devon longstraw and the whole building is clad with rustic waney edge timber. And it only costs £7500. Yes, you read that right. And no, I didn’t forget to type a couple of zeros. Even better, the cottage is not situated in some God-forgotten corner of the mid-Pacific. It is bang in the middle of London (or anywhere in the UK for that matter). The only drawback?there always has to be one, isn’t there? ?is that, at 6′ wide by 6′ long by 6′ 6″ high, it isn’t exactly Buckingham-palatial in size. OK, it’s a bit on the smallish side, especially in height. The truth is?it is a Wendy house. 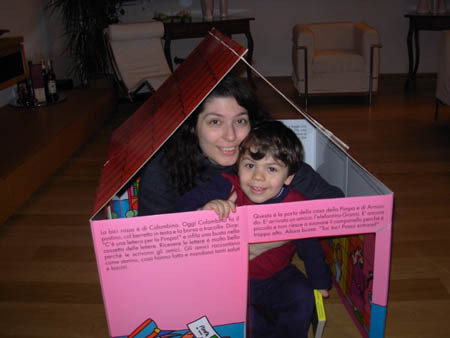 But considering that, every evening, I have to arrange my limbs in daring yoga poses to fit in a 2’7″ by 2′ 5″ by 3′ cardboard playhouse (which is already too small for my two-and-a-half year old son), I may as well live in a Wendy house. At least I’ll be able to buy my dream home?and stretch my legs at the same time.